We are the connections between the places we inhabit. When I first moved to Portland, Oregon in August 2001, I was 17 and had never lived outside the Mexican enclave where I grew up in postcolonial Orange County. Suddenly I was sharing a dorm with kids from very different backgrounds, and I thanked my lucky stars that my older sister had had cable so that I could at least reference the Nickelodeon shows they'd watched during their more secure childhoods. Without the rock en español station whose airwaves had drifted up from Tijuana to my bedroom at home, I started listening to hip hop radio because if I closed my eyes the songs reminded me of the music I heard from cars passing outside our apartment in the Villas de Capistrano. Then I fell pretty quickly into a social life beyond anything I'd known as an introverted teenager, and set aside my anger about the racist situation at home and my questions about my own identity as a non-native-Spanish-speaking-but-brown product of a Mexican-American union. The radiant heating that emanated upwards through my linoleum dorm room floor soothed me into dreamy states I'd never achieved at home, where my childhood anxiety spiked my veins with panic every time I heard a police siren. I spent my time making friends laugh, getting deeper into my longstanding interest in recycled fabrics, and, eventually, riding a bicycle. Occasionally I had opportunities to lament my rusty Spanish with fellow Latinos, but I mainly conceived of my culture as an aesthetic. When I grew restless in Portland and decided to start graduate school in Southern California, I didn't anticipate embarking on an adventure that reconnected my teenage sense of indignation at the ways people keep each other down with my newer, embodied love of riding a bike. But that's what happened, and why my dissertation is about bikes, the (un)desirability of particular bodies, and the impact of social life on Los Angeles' streets. 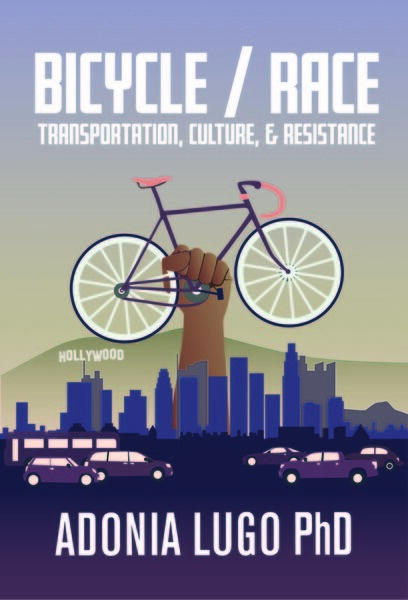 I see myself now as an advocate for bike justice, commenting on the embeddedness of bicycling and other sustainable practices in historied landscapes of race and class bias. 1. A motorist honking and screaming at me and my boyfriend, presumably for riding bikes. 2. A pedestrian halting in the crosswalk, I think because she didn't believe I would stop my bike at the stop sign I was approaching. 3. A discussion group for mixed race activist women. 4. An organization fighting to bring the benefits of the city's bike economy to workers and people of color. 5. A prominent local bike advocate dismissing social justice as a relevant concern for the bike movement here, to a national audience. 6. A motorist waving me through at a four way stop where I did not have the right of way. I met a new collaborator yesterday who shared his intriguing hypothesis about why something like "social justice" might seem unpalatable to people here: perhaps Portland absorbs the white flight of people fleeing more complicated situations in other regions. Then when they settle here, they don't want to hear about race/class inequality; isn't that what they moved here to avoid? It rang true for me as I reflected on the endless bungalows of this small-town-feel city, a controlled environment à la Disneyland but with bikes. I thought about my own escape here in 2001, and what a different person I am from the Adonia who moved to Long Beach in September 2007. I've been co-produced through the places I've inhabited, angry about the racism of my hometown, carfree because of a seed planted in Portland and cultivated at the L.A. Eco-Village, and concerned about green gentrification because of the time I spent in Seattle. I moved back here because Portland has the opportunity to buck the green segregation that is spreading the benefits of economic recovery to some communities and shunting others to the outskirts of our increasingly expensive metropolises. It's clearly been a national leader in bike innovation. Can it also be a national leader in fostering a diverse future for American cities? Can there be a sustainable urbanism that confronts rather than displaces urban history? My training in anthropology, and my life as a cross cultural person, make me want to grapple with the less material aspects of urban experience, the feelings, the cultural attitudes, the expectations of our fellow road users. This city can be a rich field in which to experiment with the question of why, even now, people have "one less bike" stickers on their cars and feel threatened by cyclists. I want to help challenge the idea of a homogeneous Portland where everyone complies with the same norms. We hybrids exist, here in Portland and all over the world. There will be no Main Street, U.S.A. without us, and there never has been.